Music Makers camp is intended for children entering a 2nd through 6th Grade classroom in September 2019. Corlears is easily accessible by the A, C, E, 1, 2, 3, F, M, and L subway lines. Music Makers is offering one eight-day session, from Monday, June 24 - Wednesday, July 3. Earlybird care is available beginning at 8:30am, for a cost of $5/day. Aftercamp care is available until 6:00pm, for a cost of $15/day. Keep the beat this summer at Music Makers! Who are the counselors? Our Music Makers counselors are Keyla Orozco and Claudia Govantes. Keyla and Claudia are both experienced music teachers who can’t wait to make amazing music with our campers this summer at Camp Corlears! What will my child do at Music Makers? Music Makers will be a space for children to listen to, appreciate, and, of course, create music together. 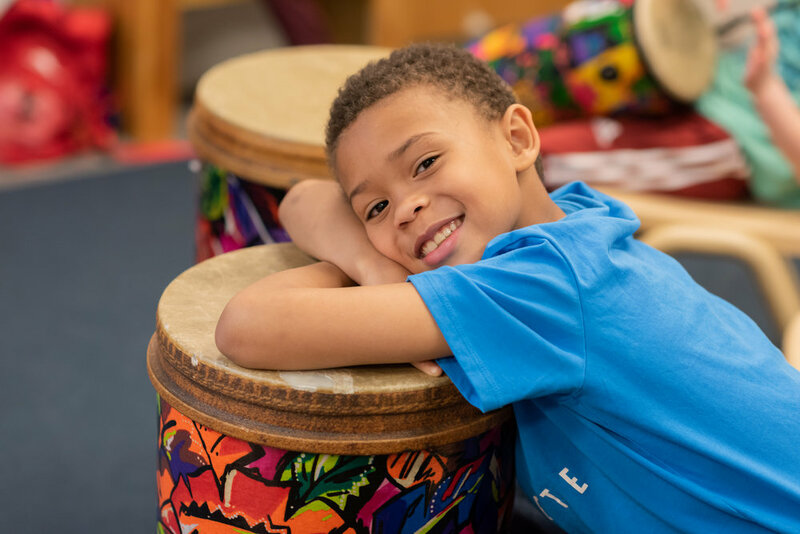 Campers will get to grow their passion for music through instrument-playing, singing, dance, musical games, and projects that blend visual art and music. Our eight-day Music Makers camp will culminate with a final performance, where students will share an original composition! In addition to all sorts of music-related activities, students will spend plenty of time playing outside at local parks, AND will swim on Tuesdays and Thursdays at the nearby McBurney YMCA. How does swim work? Our Music Makers campers will head to the McBurney YMCA (a ten-minute walk from Corlears) for swimming three times — Tuesday, June 25, Thursday, June 27, and Tuesday, July 2. The YMCA provides experienced lifeguards and swim instructors, who help to sort campers into small groups based on their age and experience. At each swim period, campers will enjoy a 30-minute session of aquatic instruction and recreation in the YMCA’s heated, indoor pool. What if my child doesn’t know how to swim? That’s no problem! We expect many campers may have limited swimming experience prior to joining the camp. Children who are totally new (or fairly new) will start with basic skills, and be aided by floaties and pool noodles to help acclimate them to the water. How does lunch work? Campers must bring their own lunch with them each day, that does not require refrigeration or heating. Please remember that Corlears is a nut-free facility. What about snack? Snack will be provided for all students -- parents need not pack snack for their child. What if my child isn’t feeling well? There will be a registered nurse on premises throughout the summer, in case any campers are not feeling well or need medical attention. Will my child receive an awesome Camp Corlears tee shirt? Why yes! Sorry, we only have shirts for campers, not parents.